One of the UK’s leading drug and alcohol charities has warned that the UK is ‘only scratching the surface’ and underestimating the serious public health challenge posed by Novel Psychoactive Substance (NPS) or ‘legal high’ misuse. 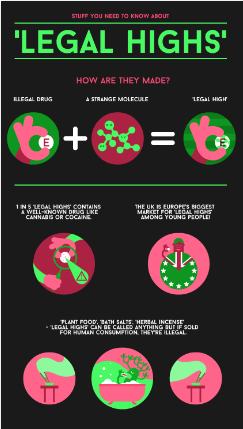 CRI aims to educate young people on the dangers of taking these substances, which it calls ‘strange molecules’. It offers support to people via its services across the UK and runs two specific legal high and club drug clinics in Brighton. These drop-in clinics are seeing a rise of people using synthetic cannabinoids like ‘Spice’, Mephedrone, MDMA, ketamine, Poke and Euphoria. Many of these substances are freely available in shops located on the high street, as well as online. As part of its new campaign, CRI has launched a new website, www.strangemolecules.org.uk, to "keep young people informed of the facts in a rapidly changing environment that sees new drugs discovered every week". Prof. Fabrizio Schifano, CRI’s Consultant Psychiatrist and Chair in Clinical Pharmacology and Therapeutics in the University of Hertfordshire, has been at the forefront of collating evidence around the UK’s legal high situation. Speaking about the Strange Molecules campaign, he said: “When you think that the UN Office on Drugs and Crime has picked up 348 new psychoactive substances, and that new ones are being developed every week, it’s clear that we are only scratching the surface of a serious public health challenge. "What’s so worrying is how little is known about these substances, yet they are quickly becoming the drug of choice for many impressionable young people. If we can dissuade them from taking these dangerous, unregulated drugs by giving them the facts, then we’re already winning half the battle." The number of deaths from Novel Psychoactive Substances has been increasing rapidly in recent years, with 2012 showing the highest number on record according to research from the National Programme on Substance Abuse Deaths. CRI suggests that in the future legal highs could cause significant harm to the same extent as higher-class drugs such as crack and heroin. Chief Executive of CRI David Biddle added: “We believe that the common term of ‘legal high’ is incredibly misleading; legal does not equate to safe, and some substances which were legal have now been classified. Some of these substances are highly potent and can be very risky, possibly up to 10,000 times stronger than the street drugs they emulate, with tiny amounts able to trigger extreme psychoactive responses. "Novel Psychoactive Substances have already dramatically changed the trends in problematic drug use in the UK. It is clear that there is still work to be done to research, treat, understand and describe these substances in a way that fully appreciates their scale and effects. It is very important that good quality, easily accessible information is made available to inform and educate. We want our Strange Molecules campaign to reach the people who need to know the most – young people, their families and the professionals who support them."